F. S. Haas was Francis S. Haas (1827/28-1889). Eugene L. Armbruster (Brooklyn's Eastern District, 1942, completed 1928) has this to say about Francis S. Haas, "Francis S. Haas' Iron Foundry was located in a brick building between Scholes and Meserole Streets [on Bushwick Parkway [Avenue]]" (pg. 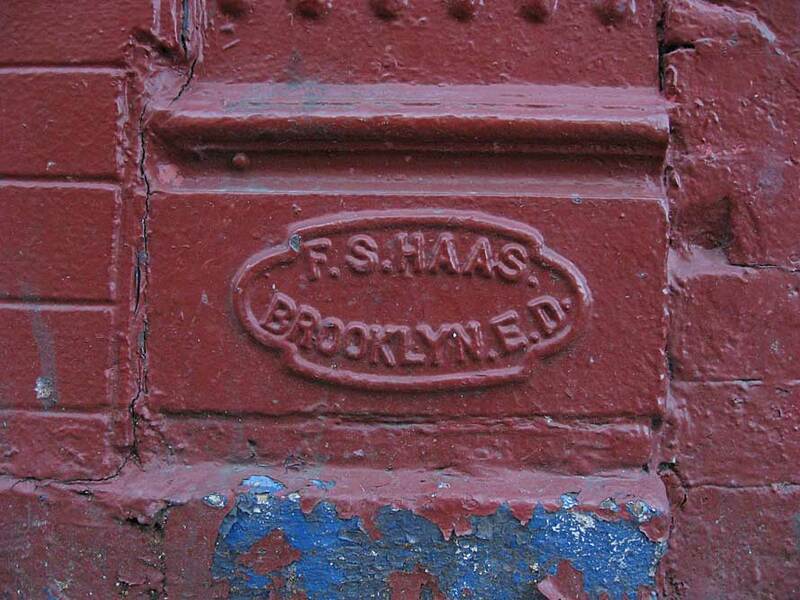 121), and "Francis S. Haas' Iron Foundry was established in 1860, the foundry occupied a brick building with a frontage of 125 feet on Scholes Street and 175 feet on Bushwick Avenue" (pg. 281). Francis Haas, founder and moulder, appeared in Brooklyn city directories in 1857. In 1863 his address was given as "Scholes corner Morrell." Armbruster, again, explains, "Morrell Street was opened in 1853 from the Newtown Turnpike (Flushing Avenue) to Maujer Street. When Bushwick Avenue was straightened in 1860, the crooked portion of Bushwick Avenue was cut out and a part of Morrell Street, between Maujer and Siegel Streets was incorporated in place of the crooked portion. The latter became known as Old Bushwick Avenue and is now known as Bushwick Place." The current (2012) Bushwick Place stops at Meserole St., a block south of Scholes, but probably continued further north in the 1860s and likely intersected close to Bushwick Ave.
IRS tax assessments in the 1860s included Francis S. Haas at Morrell & Scholes Sts. Haas was assessed $6.67 in 1863 and $6.33 in 1866. 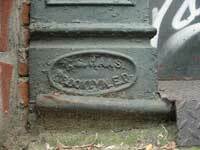 Haas' address, Scholes corner Morrell, remained constant until 1872, when it changed to Bushwick Ave. corner Scholes. 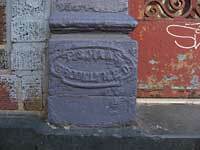 Francis S. Haas was recorded in the 1880 U. S. Census living at 195 Morrell St., Brooklyn. He was 52 years old, born Prussia, the owner of an iron foundry. His children included a son, also Francis S., age 21, a superintendent at his father's business. In the early 1880s Haas took his son, Francis S. Jr., as a partner, and the business became Francis S. Haas & Son. This ad for Francis S. Haas & Son appeared in the Brooklyn City Directory, 1885. 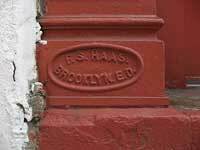 In 1889 the Brooklyn Daily Eagle (1 Dec 1889, p. 1) wrote, "At 1:30 o'clock yesterday afternoon, at his residence on Bushwick avenue, near Scholes street, after a short illness, died Mr. Francis S. Haas, founder of the Bushwick Iron Works, corner of Scholes street and Bushwick avenue. Deceased was born in Lowenthal, Prussia, sixty-one years ago, and there learned the trade of iron founder. He arrived in this country forty-nine years ago, and obtaining employment in Moore's iron foundry in Walton street, soon became foreman, and ten years later (1859) started business on his own account and established the Bushwick Iron Works, corner of Bushwick avenue and Scholes street, of which he was proprietor up to the time of his death. He was reputed among the wealthiest men in the Eastern District. His real property is situated in the Sixteenth and Twenty-fifth wards. He leaves an only son and successor, Francis S., Jr., and four daughters, all grown up, and eight grandchildren, to whom he was much attached. He leaves beside one brother, William, who had been connected with him in business, and two brothers, Anton and Leopole, in Prussia. ..."
The business was continued until around 1894 under Francis S. Haas, Jr., but by 30 Jan. 1897, when this ad for the Bushwick Iron Works appeared in the New York Tribune, ownership had passed to Charles O. Brown. Charles O. Brown continued to be listed in Brooklyn city directories at the Bushwick Iron works through 1904. In 1896 the Tenth Annual Report of the Factory Inspectors of the State of New York, January 27, 1896, reported that the Bushwick Iron Works at Bushwick Ave. and Scholes St. employed an average number of 75 male workmen, plus 50 hours of labor by minors per week. 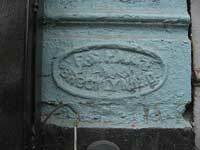 The foundry mark at 445 E. 6th St. is the only one I have found in Manhattan.